Cardiac output is defined as the volume of blood pumped by the heart in one minute. The greater the cardiac output, the greater will be the mean arterial pressure. Cardiac output is dependent on two factors – stroke volume and heart rate. Both the heart rate and the stroke volume are directly proportional to the cardiac output. However, under a constant value of cardiac output, they share an inverse relationship with each other. Heart rate is the number of heartbeats per minute. As the heart rate increases, the cardiac output also increases. The heart rate is controlled by a relative balance between the parasympathetic and the sympathetic nervous stimulation. The former decreases the heart rate, while the latter has the opposite effect. The accelerated heart rate in the sympathetic stimulation is because of the release of epinephrine by the sympathetic nerves. It acts on the cardiac muscle to increase the heart rate. Stroke volume is the volume of blood pumped by the heart in one beat. It increases in response to sympathetic stimulation and by an increased venous return to the heart. Sympathetic stimulation of the veins increases vasomotor tone and therefore increases the venous return. Respiratory pump: The pressure gradient between the supra-diaphragmatic and infra-diaphragmatic parts of inferior vena cava, produced by the inspiratory movement, increases the venous return. This pressure gradient is created by the decreased intra-thoracic pressure and the increased intra-abdominal pressure caused by the movement of the diaphragm during inspiration. Vena cava compression: When the thoracic vena cava is compressed as in the valsalva maneuver or during late pregnancy, it decreases the venous return. Gravity: The gravity causes pooling of blood in the veins of lower parts of the body which creates a pressure gradient. This should practically increase the venous return. However, as the person stands up, the right atrial pressure decreases and so does the stroke volume, which eventually decreases the arterial pressure. Right atrial pressure: As there is no valve present between the right atrium and the vena cava, any change in the pressure in the right atrium will alter the venous pressure. Cardiac suction effect: The cardiac suction effect increases the venous return, as it tends to pull more blood from the vessel into the ventricles. Blood volume: An increase in the blood volume increases the venous return. 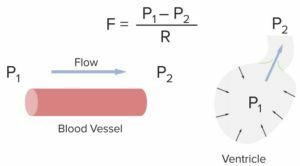 The volume of blood depends upon the percentage of blood and shift of fluid present in the vascular and interstitial compartment. It also depends upon the salt and water retention by the kidneys, under the action of vasopressin hormone and renin-angiotensin-aldosterone system. 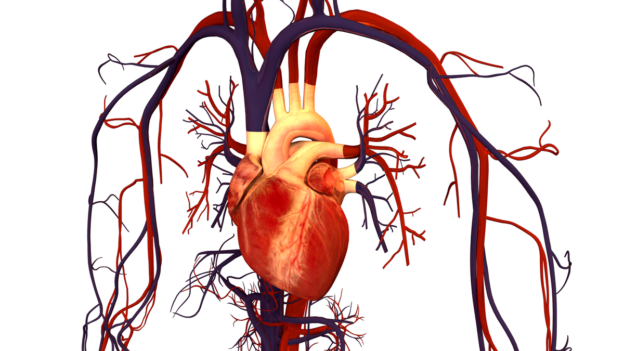 The resistance of the arteries to the blood flow is called the peripheral resistance. As the peripheral resistance increases, the mean arterial pressure also increases. Factors which affect the peripheral resistance are the arteriolar radius, blood viscosity, and vessel structure. Arteriolar radius: As the radius of the artery decreases, the peripheral resistance increases and so does the arterial pressure. In this situation, the blood flow to the tissues will also decrease. The arteriolar radius is influenced by the local metabolic control, which may cause vasodilation to increase the flow of blood to the tissues or it may result in vasoconstriction. Sympathetic stimulation and the release of epinephrine also result in vasoconstriction. Similarly, other hormones such as vasopressin and angiotensin II increase peripheral resistance by decreasing the radius of the arteries. Blood viscosity refers to the presence of cellular components in the blood. The greater the percentage of the cellular components, the greater will be the blood viscosity and hindrance in the blood flow. As the blood viscosity increases, the peripheral resistance also increases. Vessel structure: With an increasing age, the elastic tissue content of the arteries decreases. Arteries, therefore, do not effectively compensate for the increasing blood pressure because of an increase in the peripheral resistance. The renin-angiotensin-aldosterone system is a hormone system that regulates the plasma level of sodium and the arterial blood pressure. It is either activated as a result of a drop in blood pressure, which is sensed by the baroreceptors, or if there is decreased renal perfusion. Once activated, the juxtaglomerular cells secrete an enzyme called renin. Renin converts angiotensinogen to angiotensin I. An enzyme called angiotensin converting enzyme (ACE), found in the capillaries of the lungs, converts angiotensin I to angiotensin II. Angioten II causes vasoconstriction of the arterioles. This increases the peripheral resistance and an increase in the systemic arterial blood pressure. It also causes a release of aldosterone from the zona glomerulosa of the adrenal cortex. Aldosterone acts on the distal convoluted tubules and the collecting duct of the kidney to increase the reabsorption of sodium ions. It stimulates the pituitary gland to secrete antidiuretic hormone (ADH), also known as vasopressin. ADH also acts on the collecting tubules to increase water reabsorption by the formation of aqua-porins on the luminal surface of epithelial cells. The final outcome of the activation of the renin-angiotensin-aldosterone system is the increase in peripheral resistance, salt and water retention which will cause an increase in arterial blood pressure. A decrease in blood volume causes a release of epinephrine and norepinephrine by the adrenal gland. Both epinephrine and norepinephrine tend to increase arterial blood pressure by increasing the heart rate and the cardiac force of contractility. Norepinephrine is mainly responsible for the vasoconstriction because of its stimulation of the alpha receptors present on blood vessels. Epinephrine, on the other hand, causes vasodilation at low concentration (by activation of beta-2 receptors) and vasoconstriction at high concentration (by activation of alpha receptors). The final response is the increase in cardiac output. Erythropoietin is a hormone secreted by the kidneys in response to low hemoglobin levels in the blood. Erythropoietin acts on the hematopoietic stem cells in the bone marrow and stimulates the production of red blood cells. An increased number of red blood cells in the plasma will increase the plasma viscosity which will increase the peripheral resistance and finally the arterial pressure. An adult male admitted in the cardiology ICU with a complaint of severe chest pain, shivering and sweating. He was shifted to the ICU after an EKG. His blood was sent to the laboratory for cardiac enzymes and lipid profile. On examination, HR 124/min, RR 37 /min and BP 160/100 mmHg with a temperature of 99 F. ECG showed tall T waves in lead 2 and avF. What would be the mean arterial blood pressure of this patient? A trauma patient was brought into the surgical emergency department after a road accident. He has been bleeding due to head wounds for the last hour. On examination, pulses were barely palpable, HR 110/min, RR 40 /min, temperature 98 F and BP 80 systolic. Which of the following body systems is activated in this state? Sherwood, l. (2010). Human physiology. 7th ed.